According the various news reports, including TMC's Greg Galitzine who also reported on the possibility last May, Microsoft is going to "assimilate" Yahoo. For non-Star Trek fans, that means the big powerful Borg (Microsoft) is going to take over (assimilate) Yahoo. Microsoft Corp. has apparently made an unsolicited $44.6 billion offer for Yahoo! Inc. in a bid to challenge Google Inc.'s dominance in all things Internet, specifically search and advertising. The offer of $31 a share in cash or Microsoft stock constitutes a greater than 60% premium over Yahoo's closing price January 31. I'm just surprised Microsoft didn't buy them much earlier. Perhaps Microsoft thought they could go at it alone with their www.msn.com search engine, but it just didn't pan out. Microsoft and Yahoo have worked closely in the past, including getting their IM clients MSN Messenger and Yahoo! Messenger to interoperate back in 2005 - only IM though not VoIP. It will be interesting to see how they merge and integrate their various internet properties. Perhaps we'll see VoIP interoperability now between their two popular IM clients? Update - Rich Tehrani has more thoughts. \nAccording the various news reports, including TMC's Greg Galitzine who also reported on the possibility last May, Microsoft is going to "assimilate" Yahoo. 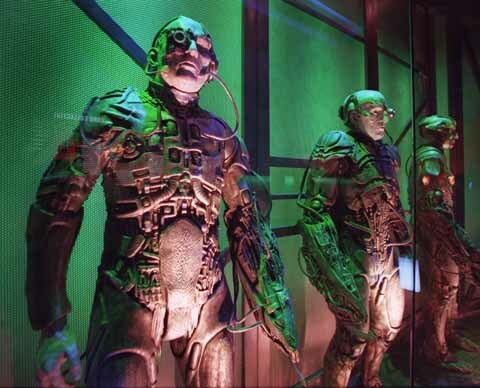 For non-Star Trek fans, that means the big powerful Borg (Microsoft) is going to take over (assimilate) Yahoo. \nMicrosoft Corp. has apparently made an unsolicited \$44.6 billion offer for Yahoo! Inc. in a bid to challenge Google Inc.'s dominance in all things Internet, specifically search and advertising. \nThe offer of \$31 a share in cash or Microsoft stock constitutes a greater than 60% premium over Yahoo's closing price January 31. \nI'm just surprised Microsoft didn't buy them much earlier. Perhaps Microsoft thought they could go at it alone with their www.msn.com search engine, but it just didn't pan out. Microsoft and Yahoo have worked closely in the past, including getting their IM clients MSN Messenger and Yahoo! Messenger to interoperate back in 2005 - only IM though not VoIP. It will be interesting to see how they merge and integrate their various internet properties. Perhaps we'll see VoIP interoperability now between their two popular IM clients? \nUpdate - Rich Tehrani has more thoughts.